In this post, how one can add disclaimer to all outgoing emails in Office 365/Exchange Online manually without any expert is discussed. One just simply needs to follow the method and add disclaimer to the emails to ensure security, confidentially, the liability of email content. Email is the important business tool used by many organizations. However, using emails without any signature and disclaimer is like giving an invitation to the number of legal threats. Therefore, from the security point of view, it is important to attach a disclaimer to every outgoing email from Office 365/O365. Now, what exactly is email disclaimer? It is the statement that is added to all emails sent from a particular organization. It is usually added to disclaim liability or marketing purpose as well. Moreover, the disclaimer statements are mainly of legal characters drafted by the legal department of an organization. Now, to make it more easy for IT administrator, these disclaimers can be managed through central location also and can be added to each email automatically using Office 365 Transport rules. These IT administrators can easily manage Office 365 Admin accounts from a single panel using a third-party service. After understanding the main reason behind applying a disclaimer, method of how to add disclaimer to all emails in Exchange Online is discussed. The content of this email is confidential and only for the recipient that is specified in the message. It is strictly prohibited to share any content of this email message with any of the third party, without having a written consent provided by the sender. In case you received this message by mistake, then please reply back to this message and delete it from your system immediately, so that we can make sure that all such type of mistakes does not encounter in the future. 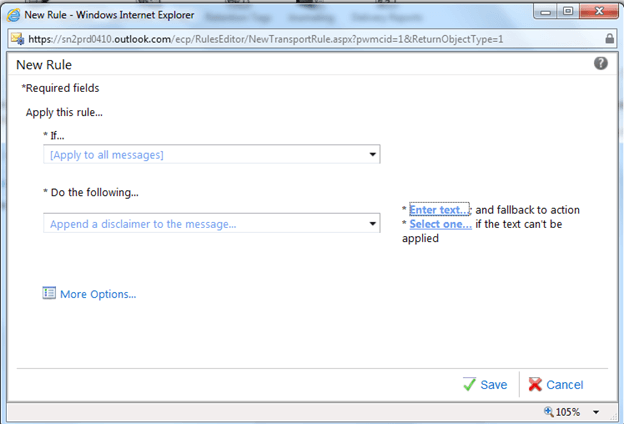 Why Add Disclaimer to All Outgoing Emails in Office 365? Legal Protection - Email disclaimer provides all type of legal protection to an organization. Any type of confidentiality, security, liability, entering into contracts, misstatement issue can easily be avoided using a disclaimer in the email message. Moreover, it also prevents the actual occurrence of legal proceeding against an organization. Marketing Purposes - Another main motive of attaching a disclaimer is that it help in the marketing of an organization. One just needs to add an organization’s address, URL to the disclaimer. For example, it is also helpful in adding a footnote that contains a new coming fundraising or outreach campaign. Regulatory Compliance - In order to prevent the client privacy, the new and existing regulations are used. Moreover, it is also used to keep the record of email communications and ensure the secure confidentiality of information. Thus, to accomplish all this, it is necessary for an organization to add disclaimers at the bottom of their emails to make sure the integrity of their patients or clients and to overcome any confidentiality failures. Wrap: Create a new message enclosing the original message and the disclaimer is included in the new message. After this, the recipient will always receive a message with the disclaimer. 3. Now, choose The sender… & is a member of the group option, and then you need to choose the group corresponding to the department. Attaching a disclaimer at the bottom of the email messages is the most important activity that needs to be done by all organization for security, liability, and marketing purpose. 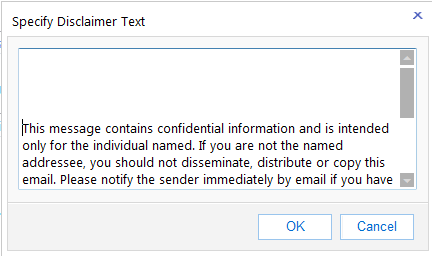 Thus, after understanding the need of adding disclaimer, a simple and easy method to add disclaimer to all outgoing emails in Office 365 account. A user can easily use this method discussed above without any expert help. Moreover, the method also allows users to apply a disclaimer to specific group without any hassle. I hope you enjoyed this guest post by Tej Pratap Shukla. If you're interested in being a guest blogger, get in touch with me (contact links at the bottom of this page).